EC Series electrodes chamber is comprised of Platinum coated Titanium electrodes with a patented matting, which enhances ionization efficiency by resisting to mineral deposits. The Electrode Plates are iridium-free. The electrode chamber is specially designed to drain off all excess water in the electrolysis chamber between uses. This provides the electrodes with longevity built to last at least 15 - 20 years. The titanium is coated with platinum for excellent, yet durable, conductivity. The combination of efficient draining, improved matting, and revised inner structure enable EC Series to operate over for 100 hours continuously. 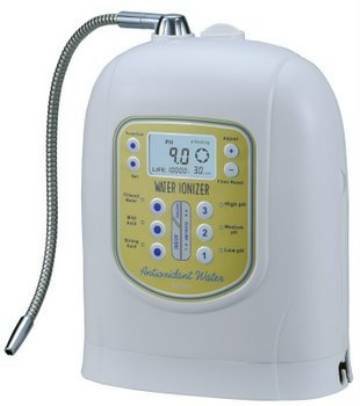 EC Water Ionizers are smaller which helps to take up less space and provides easier portability. Automatic cleaning alert every 12 hours the LED light blinks. The EC Series comes with and installed one micron flow-through sediment fiber carbon filter which removes chlorine, particulate and other harmful elements from tap water. Optionally a .01 Micron Filter is available. There is an Automatic Indicator Alert when Filter Requires Replacement . Comes with everything you need to install the machine. Designed for use next to or over sink. Has a wall-mount option. Please note that achieving pH and ORP readings is dependant on water source.